This is a Mass Effect Andromeda enemies article on the Roekaar faction. Here you’ll find information about a faction in Mass Effect Andromeda. The Roekaar are a group of angara that are against all alien races. They were founded and lead by Akksul. Jaal describes the Roekaar as “dangerous cousins.” Ruthless and single-minded, the Roekaar’s propaganda describes their intent to drive all alien invaders, both Milky Way and kett out of the Heleus Cluster. They were founded by Akksul, a charismatic angara who once studied with the Moshae. Jaal explains that Akksul was captured by the kett and held in a forced-labor camp for over a standard year while the Resistance could not risk a rescue. Though he survived, Akksul was embittered against the Resistance and alien life. Upon his escape, he recruited young angara and disaffected Resistance members into an independent force named after fearsome soldiers from angaran mythology. The arrival of the Nexus, portrayed as further invaders by Akksul provoked them past their breaking point. They are now engaged in full-pledged guerilla operations against all non-angaran inhabitants of the cluster. 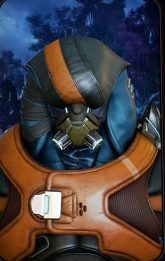 The Angaran Resistance officially disavows the Roekaar, but family and political interconnections complicate any organize opposition to them.